EZ Turbo Taq DNA Polymerase is a unique formulation of Taq DNA Polymerase that results in robust amplification and superior fidelity. EZ Turbo Taq DNA Polymerase tolerates wide range templates and produces high yields of PCR products. The enzyme has enhanced processivity and can amplify DNA target up to 20 kb. PCR products generated by EZ Turbo Taq DNA Polymerase contain a mixture of blunt ends and a 3’ A overhanging. 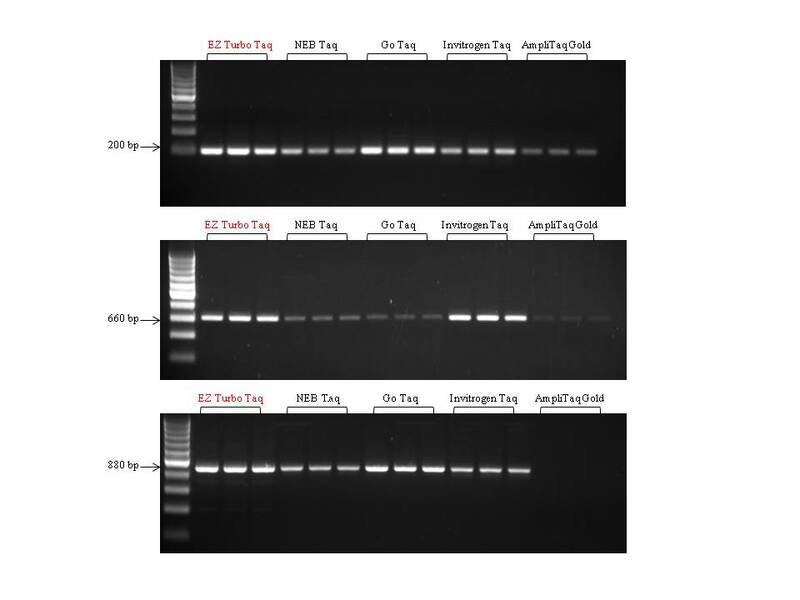 EZ Turbo Taq DNA Polymerase can be used in PCR and RT-PCR reactions. EZ Turbo Taq DNA Polymerase is supplied with either 5X Colorless or 5X Red Reaction Buffer. Robust and reliable amplification using EZ Turbo Taq DNA Polymerase. Comparison of EZ Turbo Taq DNA polymerase with other indicatedTaq DNA Polymerases to amplify three different fragments from mammlian genomic DNA. EZ Turbo Taq DNA Polymerase showed consistent robust amplification regardless of fragment size.